I spent time this week “getting the word out” about Cruising Photography & Eudaimonia. I’ve posted to a few motorcycle forums with satisfying results. Without exception, feedback has been encouraging and supportive. My statistics showed about 150 views in the four days after posting material. The articles I wrote have also been published. I could not ask for more so early in all of this. As a result of this exposure I have been exchanging emails with a number of new people. One person is a motorcyclist who wrote a book about returning to a place where he fought a war many years ago. I am reading his book and have been moved not only by his experience but also by the honesty of his writing. I have come to imagine him as a bodhisattva, someone motivated by compassion and a wish to help all sentient beings attain buddhahood. And this for someone who was a self-described grunt, a soldier in the thick of the fighting. Perhaps all of this is my imagination getting carried away — I have never met this man — but I do not think so. I hope to meet him someday and find out for sure. He reminded me there is an innate desire in all of us to share with others what we find important about life. 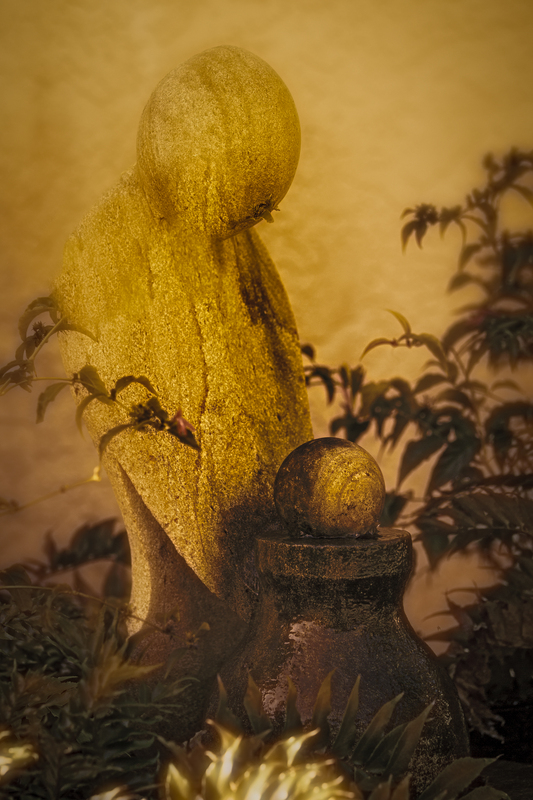 In my backyard I have a stone statue I bought several years ago because of it’s aesthetic qualities. I finally got around to adding a water pump to the cistern the figure is holding so that water now flows down its sides, darkening it with the passage of time. Every few days I need to refill the reservoir because of evaporation. At first I was annoyed having to do this so often. Then I saw I had a choice: I could see this as an annoying task, or as my visits with a bodhisattva in repose as he looks down on the flowing passage of time. It is of course neither of these things: “It is neither good nor bad, but thinking makes it so” as a certain playwright reminds us. Such was my state most of this week as I worked on my next video for the blog. These videos are developing into what I am calling Ambient Movies. Below is my first attempt at an ambient movie entitled, An Eerie Trip. You can read more about what ambient movies are and how I’m stumbling around to create them by going to What Is An Ambient Movie? But before you read my pedantic musings, just let the movie wash over you and think about the bodhisattva in repose as he looks down on the flowing passage of time. Like the video and music choice. This has many opportunities and the field is wide open and only limited to imagination and experience. Keep having fun, it shows!